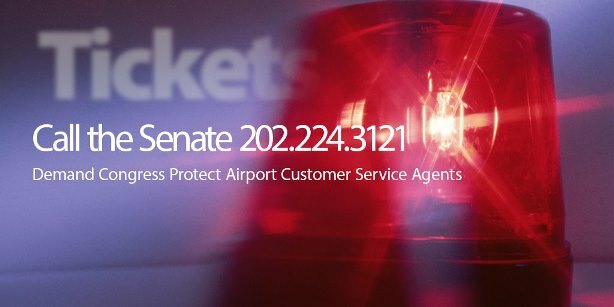 Our sources on Capitol Hill tell us the Senate will be voting TODAY on an amendment toughening penalties on assault against Airport Customer Service Agents. We need our IAM members to call their senators immediately and tell them to vote YES to an amendment to the FAA Reauthorization bill offered by Sen. Maria Cantwell (D-WA) that would enhance the criminal penalty for assaulting Customer Service Agents, adding to existing federal law protecting flight crews. Call the Senate Switchboard at 202-224-3121 and tell them you want to speak to your Senators. In one incident in 2014, a United Airlines Customer Service Agent working at the Fort Lauderdale-Hollywood International Airport was punched, dragged by her hair and repeatedly kicked in the stomach by an enraged passenger. This is all too common, and it needs to stop. IAM Customer Service Agents need your help. Call 202-224-3121 today!